After finishing the headstock, I continued on the sides. These were planed to thickness a while ago but needed to be bent. I used a bending iron, which is essentially an aluminium tube with a heating element inside. The rosewood for this guitar was much easier to bend than the maple on my previous guitar, but it was still painstaking work (at times literally painful when I burned my fingers on the bending iron!). It’s difficult to describe the bending process in words, but it basically involves rubbing the the area of the wood that needs to be bent along the bending iron. Use two hands to slowly flex the wood as it heats up, constantly rubbing the wood along the iron. As the wood heats, you suddenly feel the wood give way to the flexing. For a long consistent curve, bend the wood slightly at multiple points along the curve. Check you’ve got the right curvature by holding the side piece against the guitar template. Try to avoid blackening the wood, as burnt fibres don’t really bend. On tight corners or difficult bits of grain it helps to wet the wood with a sponge. I find that bending takes a lot of concentration and being one with the wood. You need to be relaxed and take your time. It’s important to listen as well, to be aware of tell tale signs of the wood fibres snapping or breaking. What I find particularly difficult is that I don’t have a piece of rosewood lying around to practice on and to see how far I can go without snapping the wood. This is not something you can really practice, but you don’t want to get it wrong either. Rosewood side bent and clamped to shape. These clamps are great for keeping the wood in place after bending, as I have found that the sides tend to ‘unbend’ after a day or two. 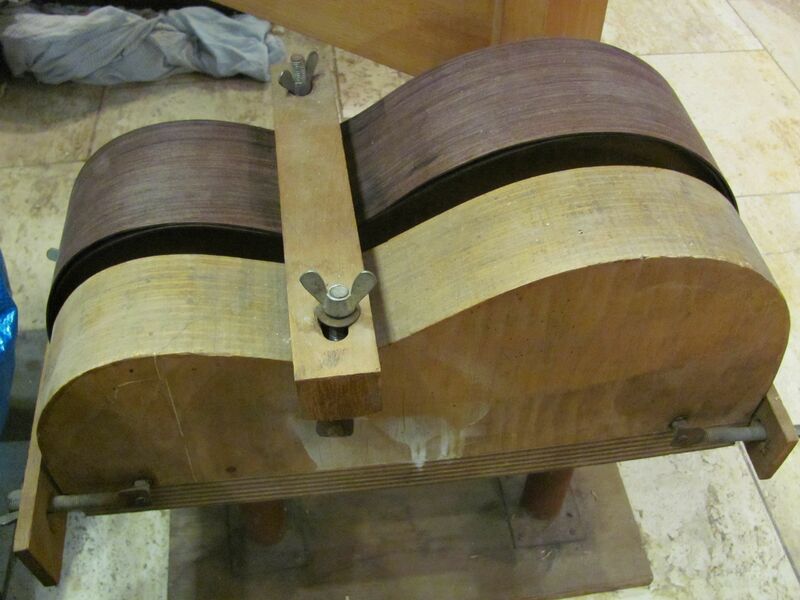 For more information: if you haven’t bent wood before, and don’t have someone who can show you, Cumpiano and Natelson’s book gives a good explanation of the technique. ← A new workbench and I’m ready to go! I always wondered how that was done. Thanks! Glad to see you are at one with the wood. And by the sound of it, enjoying your new workshop!! I’ve just bent the first side of my guitar. Quite an enjoyable experience. Your mould is a bit better than mine though 🙂 Looking forward to the next post of your build.